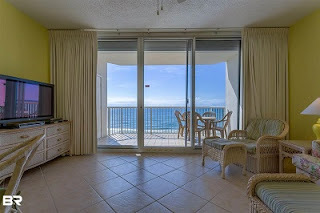 Property Info: 1 BR, 1.5 BA Beachfront Unit with 674 sq. ft. The Beach Club condominium home for sale in Gulf Shores Alabama. Rare 1 bedroom listing at the Beach Club on ideal floor in Catalina Tower! Tastefully furnished, large tile throughout, full sized bunks in hall enclosure. NEW 2016: Dishwasher, washer/dryer; NEW 2017: HVAC; paint throughout condo. NEW DEC 2018: Mattress, sofa sleeper (sofa sleeper not shown in these pictures). Storm shutters for peace of mind and extra value. View of the beach, Gulf & palm trees. Resort Amenities: 1/4 mile beachfront promenade, 5 beachfront pools & hot tubs, tennis, basketball, water sports, Clubhouse with spa/salon, indoor pool, fitness, restaurant, lounge; more food & shopping outlets on property. Club membership fees are separate from monthly condo dues. Snowbird til Mar 1st. Showings only Mon-Fri, 24 hours notice required. See uploaded 2018 rentals...come see this on today!